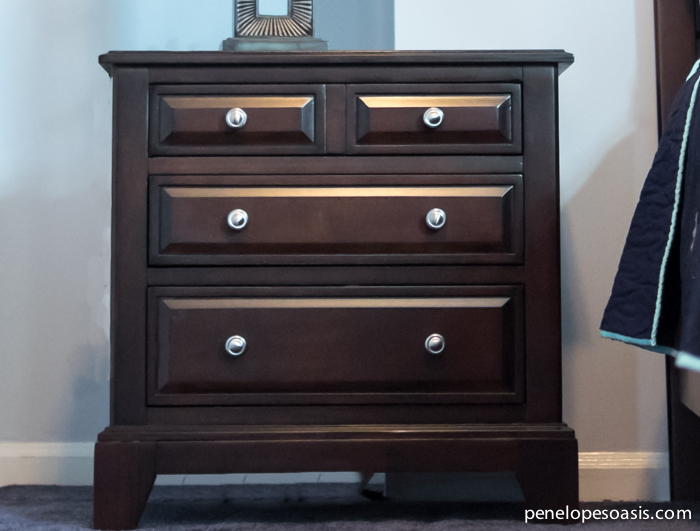 I knew the Essence Collection from Raymour & Flanigan, an espresso dark wood twin bedroom set for young boys or girls that is rich and beautiful, would perfectly bring it to life for our young explorer. It’s very versatile, and could really help transform a room into anything, so many directions to go in terms of room decor options…a pirate theme? sports? young scientist? anything! 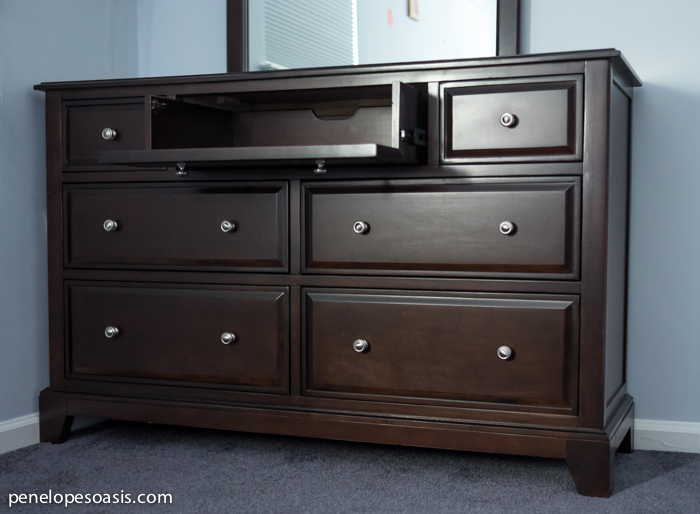 I loved the sleek and simple lines, and I definitely have a preference for dark wood. It’s very rich and well-made, so once I saw it in the showroom at Raymour & Flanigan, I just knew. 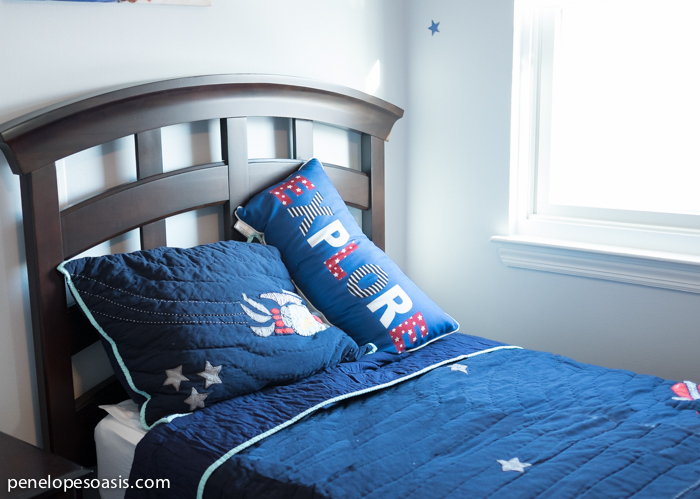 Since the room decor was focused on astronomy, outer space, rockets and planets, we found a beautiful embroidered bedding set in rich colors that looked wonderful with the Essence Collection. It is designed with our solar system, and rocket ships, and stars, to inspire him to think outside the box to what is beyond, and out there…no limits! Raymour & Flanigan White Glove Service delivered our set to us and put it altogether, so we didn’t have to worry about putting anything together or any heavy lifting…we just got to decorate and enjoy it. 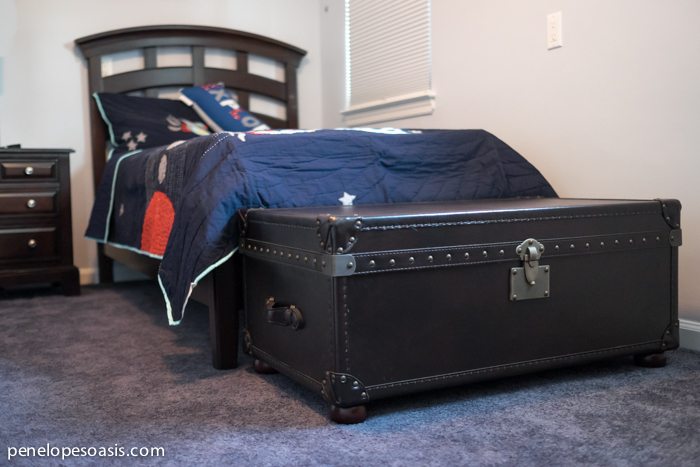 At the foot of the bed is a seriously cool trunk. It’s huge, what I envisioned Harry Potter to bring to Hogwarts every year to store his cauldron and leather bound books and quills. 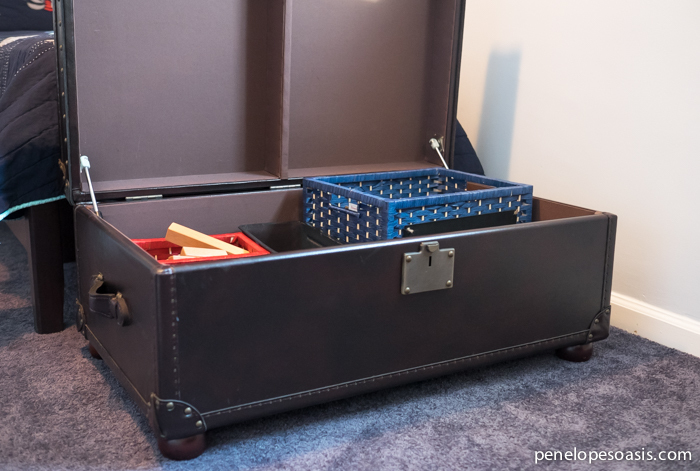 My son fills it with his building blocks, all kinds- magnetic, wooden, plastic, fiberglass, etc…he likes to build and create so we pretty much stocked his trunk with all of it so it’s easily accessible by him, and the lid closes slowly so no caught fingers. It’s quite heavy and built to last, and holds sooo much. 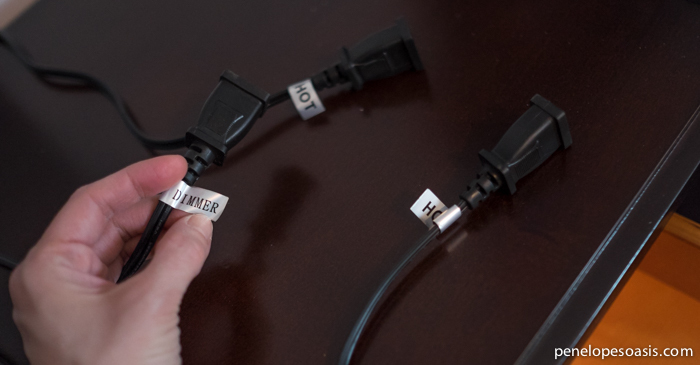 The night table is really cool, it features a single electrical plug that splits into three, one with a dimmer, so he can hook up multiple gadgets, have control over the brightness of the light, etc all while only requiring one outlet in the wall. 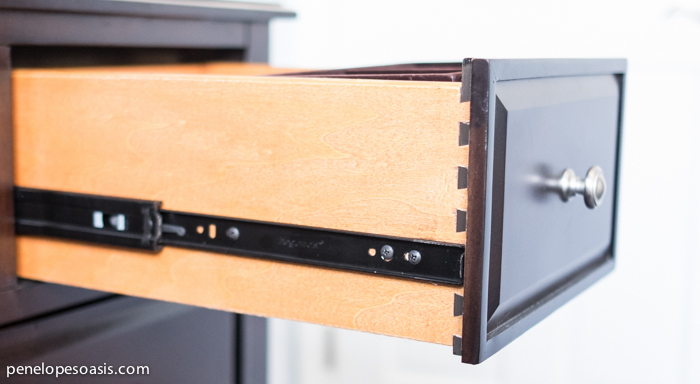 All the drawers of the Essence Collection are English dovetailed for strength and durability, and both the night stand and dresser come with felt-lined valets. 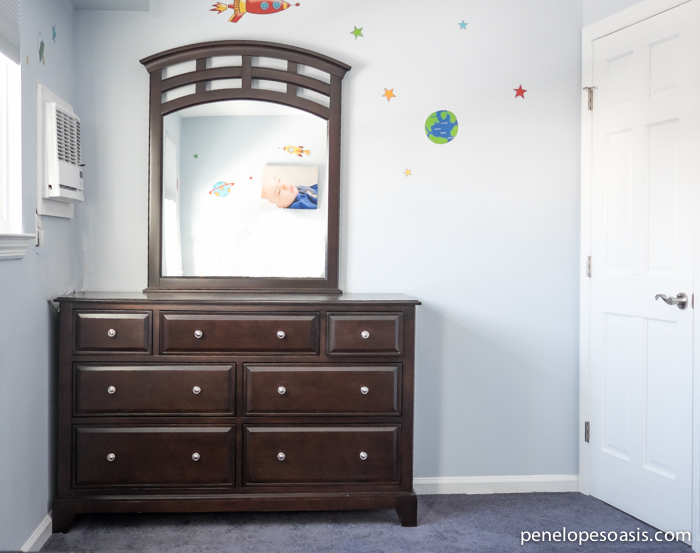 The matching dresser and mirror has the same curved detail, just beautiful, as well as seven large, roomy drawers with English dove-tailing, a felt valet, and a central drawer that opens forward without requiring that you pull it out. The drawers are barely half filled now with his small clothes for a three year old, so it’s clear this set will accommodate him for years to come, as he grows older and bigger. The Essence Collection doesn’t have a book case, so our sales associate Anthony helped us find a matching book case that coordinated beautifully our bedroom set. 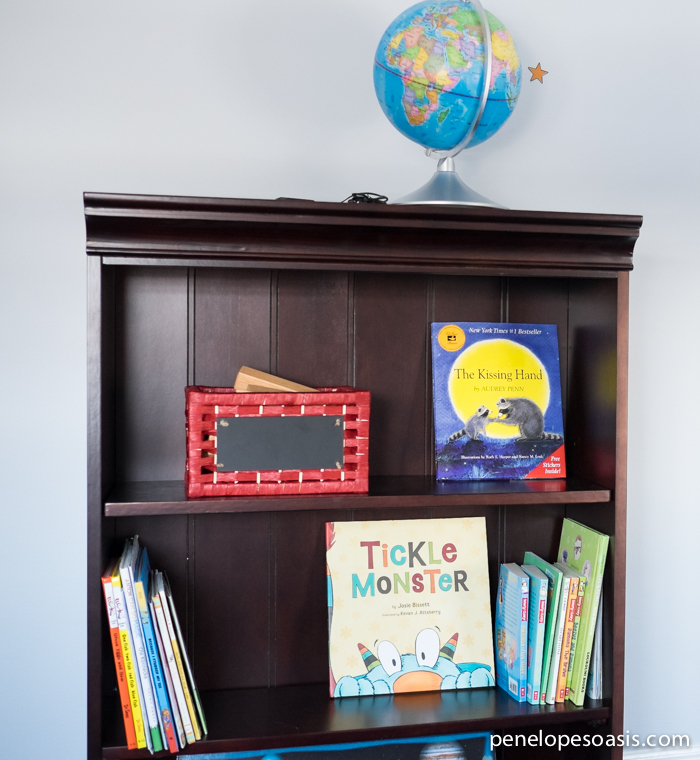 I chose the Urban Crossings 60 inch bookcase (the shorter of the two options this bookcase is available in) so our son could reach the top and use it as a display area for larger items (trophies? right now it stores his glow in the dark globe that shows our night sky and constellations when the lights are out). 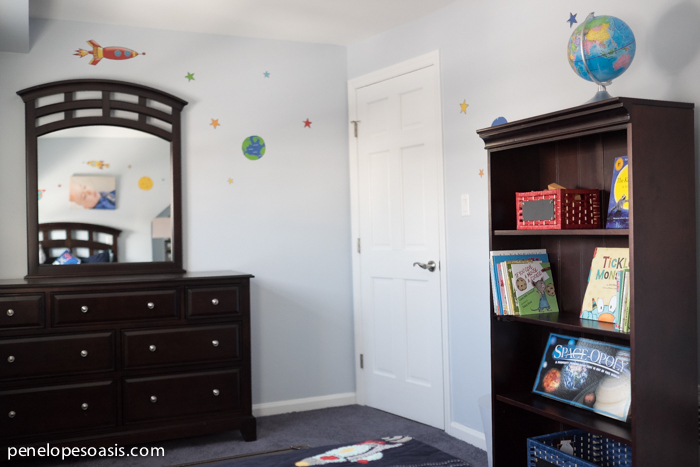 We decorated the walls with Outer Space decals in fun colors that evoke our own solar system, with colorful renditions of our planets, rocket ships and satellites, and stars. 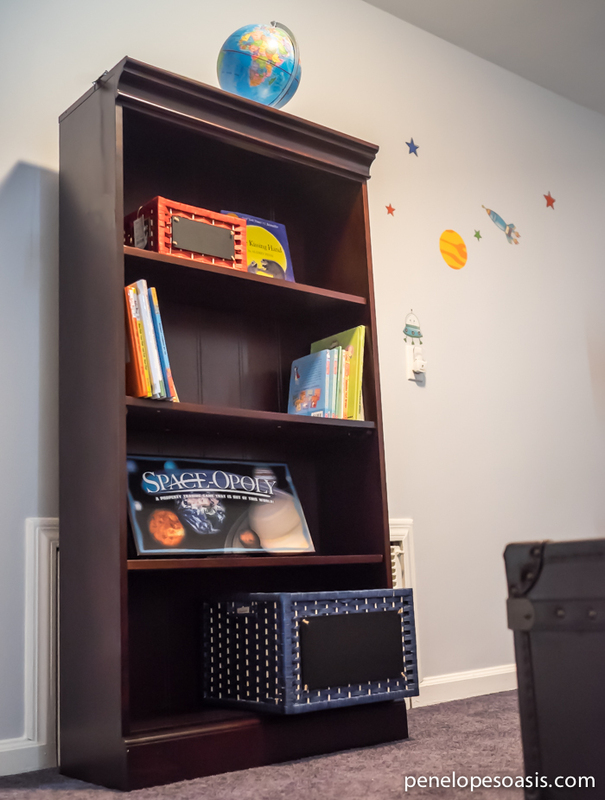 We placed a satellite on an outlet as though it had just happened to land there, but later realized the nightlight made it look intentional because of how it lights up at night…rather serendipitous, sort of told us it was meant to be there and we chose the right decor and furniture for his room. 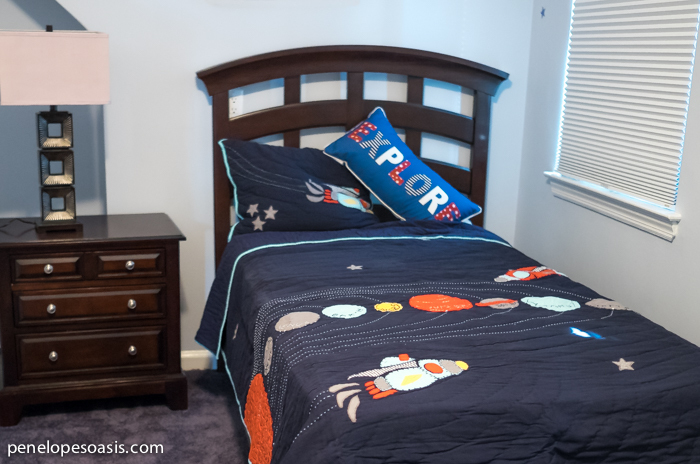 And of course, since our sons like games, we filled the room with space games and silly things that evoke space travel…it all worked together wonderfully! 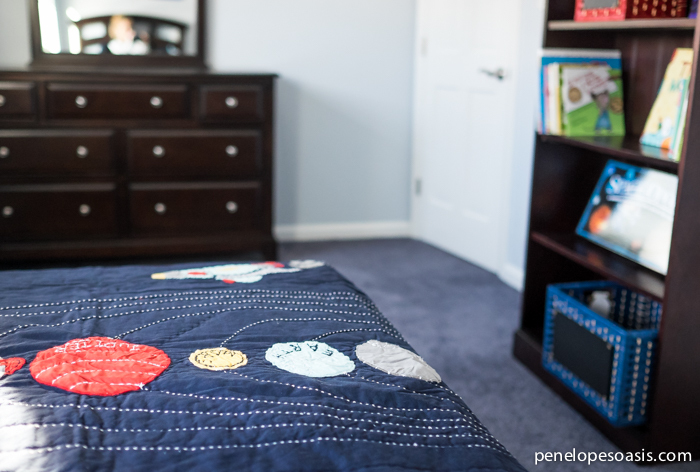 What do you think of our Big Boy Bedroom makeover? 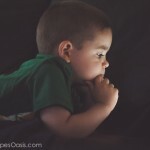 Quite a difference from his train-themed nursery room! I love that trunk. It’d be perfect storage for anything! You selected beautiful pieces. I tried to select furniture that would grow with my children, as you’ve done. I love the look of that dark wood. The decals on the wall are so cute, much better than wallpaper since they are easier to take down later! Love the whole collection. The curved lines are really fun. 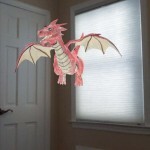 I am getting set you To design my eldest room from shared with a toddler bed, to bug boy soon. Love seeing what you created. Wow, what an amazing looking room. I love how everything came together. Beautiful and looks well made. This should last him a while. This is perfect, the boychild would love this space room. So cute! I don’t think of a single little guy who wouldn’t go CRAZY for this decor! Looks awesome! 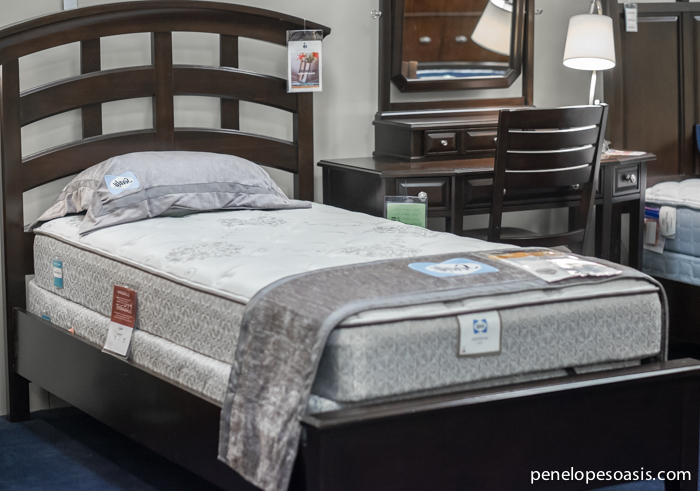 This is a lovely looking bedroom set. 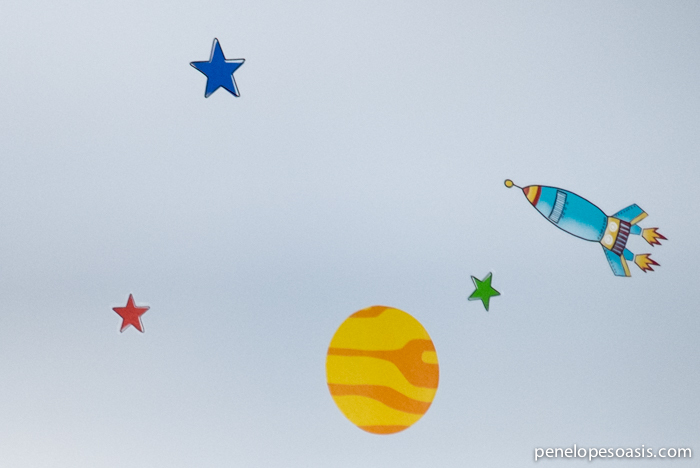 The space theme is so cute – my son’s nursery is space themed and I love to see how it can grow with him as he gets bigger. What a nice bedroom! I can’t decide what I like best a bout it! I love the bedding and the dresser set. That’s absolutely gorgeous. I really love the decor you chose!